Book your Kauai Helicopter Experience Today! Kauai is Hawaii’s fourth largest island, called the “Garden Isle,” which is an entirely accurate description of this beautiful island. The oldest and northernmost island in the Hawaiian chain is draped in emerald valleys, sharp mountain spires and jagged cliffs, aged by time and the elements. Centuries of growth have formed tropical rainforests, forking rivers and cascading waterfalls. Some parts of Kauai are only accessible by sea or air, revealing views beyond your imagination. Perhaps the best way to see the breadth and majesty of Kauai is by air. Experience the magnitude of the Napali Coast. Hover over the deep chasms of Waimea Canyon. View majestic Manawaiopuna Falls, seen in the film, “Jurassic Park.” With much of Kauai’s lush wilderness inaccessible by car, an aerial tour is the perfect way to fully experience Kauai’s hidden natural wonders. Fly high over ancient Hawaiian valleys and hear the thunderous rumble of water as you hover near high mountain waterfalls and see remote Hollywood movie sites when you take to the skies in a state-of-the-art helicopter. 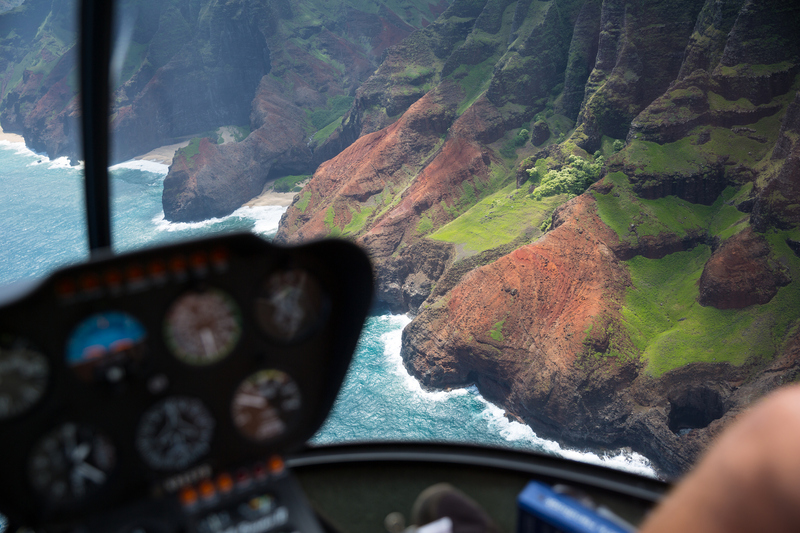 A Kauai helicopter tour is a thrilling way to see Kauai’s most beautiful areas including the world- renowned Na Pali Coastline and north shore’s pristine white-sand beaches. Tours depart from Lihue Airport and Princeville Airport. Rates starting at $205 per person.